The coin laid at the DSCT event was a commemorative medal made in honour of the late President Nelson Mandela’s 1993 Nobel Peace Prize win. 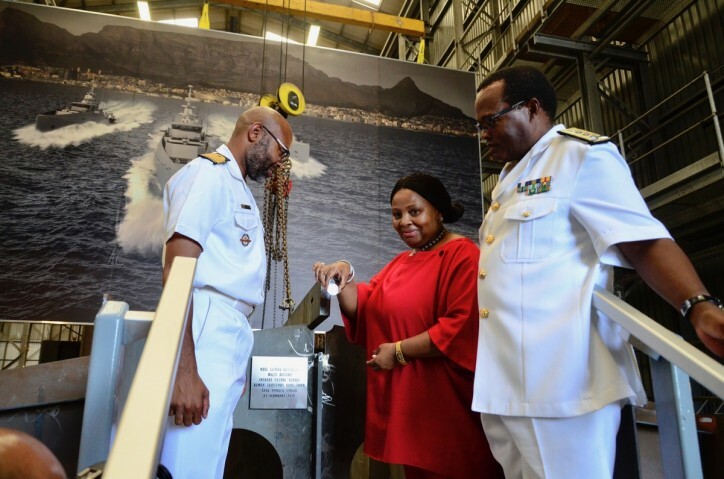 The coin was placed under the keel by the Minister of Defence and Military Veterans, Nosiviwe Mapisa-Nqakula. 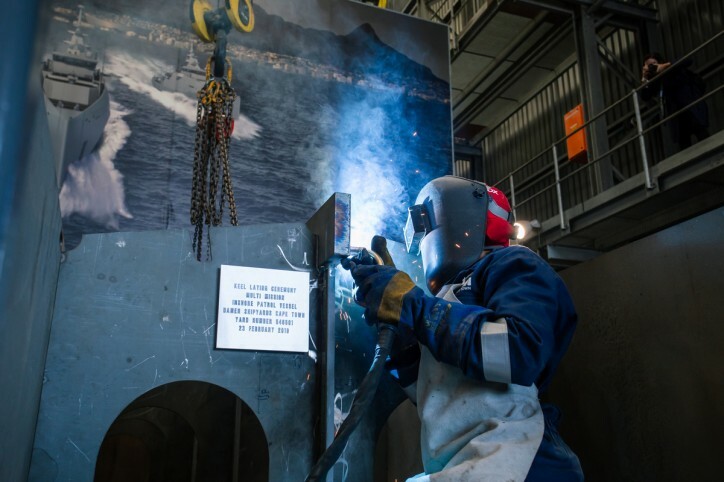 The keel bar was then lowered on top of the coin and welded into the structure – a privilege that went to Nobelungu Tshangase from Velddrif on the West Coast who is one of the top performing apprentices at Damen’s training school. The training school has since inception in 2010 educated 150 young people from previously disadvantaged communities and recently enrolled a new class of 10. “We are also supporting and facilitating opportunities for local businesses. We will be working with these Small Medium and Micro Enterprises to improve their performance which will lead to improvements in their product or service offering, business processes, lead times and delivery. This will ensure that non-traditional suppliers cease to operate on the peripheries of the formal economy and increasingly become more sustainable. Over and above this, we are striving to optimise local content”. 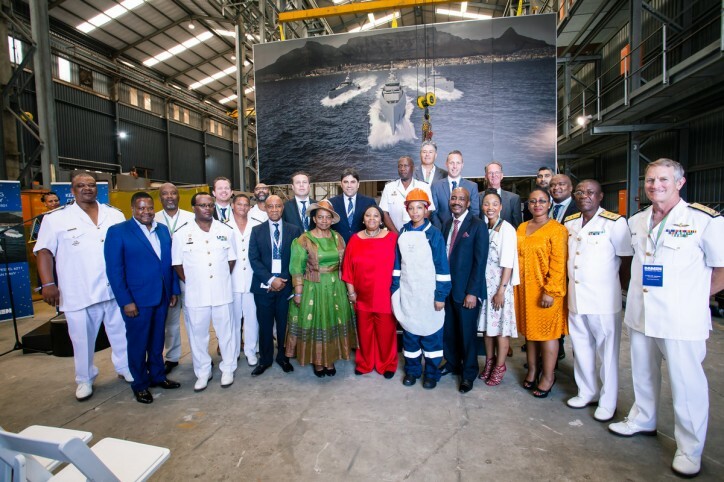 “With the building of the patrol vessels, we are demonstrating that we are truly an industrial powerhouse and most importantly, highlighting that the South African Defence Industry has the requisite capabilities and capacity, and that government spending has a positive socio-economic spin off on our society at large.” “The President of the Republic, in his now famous ‘Thuma Mina Campaign’, has invited everybody to step forward in their areas of strength and assist him and the Government in rebuilding the economy and creating opportunities for our people. I want to say to the President and to the Government, that DSCT and the Global Damen Group are stepping forward, we are raising our hands and saying: in the Blue Economy ‘thuma thina’, send us. We have the expertise, we have the technologies, we have the infrastructure, we have global experiences, and we can facilitate financial resources to help South Africa exploit the massive opportunities presented by the country’s Blue Economy,” concluded Montsi.